In early fall, we could always feel sorry that summer is gone behind, and that sunny times are going to be missed. Yet, I love this time of year. In fact, the abundance and renewal of all sorts of fresh food makes the season transition very pleasurable. Time to change food habits and revisit dishes we have not cooked for a while. Farmers’ markets are full of fruit such as apples, pears, and plums of all sorts, which remain favorites. I love l’automne for what it offers. In New England, you just need to take a walk in the forests to see why Nature does things so well. I do not think I have seen brighter colors than in New England forests in the fall. Beauty in its pure form. I always find that the most delightful feeling while driving along countryside roads is to be able to catch a glimpse of trees so much full of fruit that the weight imposed on each branch makes you feel each might break within the minute. Every single time I see quetschiers full of brightly purple colored quetsches, I know that this time, I am at home, across the Atlantic. It happens every fall if this is a good year. Quetsches are a fruit typical of France’s North-Eastern region where I am from. This type of plums is particularly grown in Alsace and Lorraine. Is it the weather? The type of soil? I am not sure. A quetsche is a lovely delicate fall fruit, with an oblong shape and a beautiful dark purple color on the outside and a yellow sweet, juicy and acidy flesh in the inside. Easily found everywhere early September and in October, it is a fruit that every single member of my family seemed to preserve. Of course, you could just not do it differently as orchards in the region are full of questschiers (questche trees). Some years, we had so many quetsches that even with the best possible intentions, it was simply impossible to preserve all of them. Instead, my dad used to make alcohol with it: eau de vie. We would keep a large container in our garage in which the fruit was left to macerate until it is ready to be distillated. Not everyone is allowed to make this type of strong alcohol but my dad was because he received the right to do so as it had been passed to him by my grand-mother when she died. Almost 100% alcohol, this eau de vie is commonly drunk as un digestif, of the type you have in small shots after a meal, to help with digestion. You can only imagine the smell in the garage! Enough to make you feel tipsy. Living in the US, I have always missed this fall fruit. For a while, I researched and tried to find quetsches here, but to no avail. Until one day, when I discovered sugar plums at a local vegetable and fruit supplier. Not quite the same as a quetsche, sugar plums are however the closest fruit I have found. They are slightly bigger, with a more reddish color than a quetsche . In taste however, they are comparable. Enough to make me happy and decide to use them for a favorite dessert of mine. Clafoutis is a classic French dessert. I have already talked about it, do you remember? The truth is that I could not let days go by and not present my classic recipe to you. This dessert is so easy to make that it would be a real shame to never think about making it. In fact, I can add the following: Clafoutis is a real culture in my family, all the more emphasized by the arrival of P., my lovely Irish and American hubbie. When P. discovered clafoutis, I was far from imagining the impact that this innocent, yet so traditional, French dessert would have on him. Really! It was as if I had given him fresh new blood. Whenever I tell him that I am making clafoutis, I know I am going to make his day. Moi : Tiens, j’ai fait un clafoutis. Me: Listen, I made a clafoutis. We all know the more traditional version of clafoutis made with cherries. Some cooks prefer to keep the cherry stones in the clafoutis, to add flavor to the dessert, although this makes the task of eating the clafoutis much harder. Unless you just like to spit them out, which is a lot of fun all things considered, as it brings the raw side of us out! Le côté sauvage ! But, as much as I love cherries as a fruit, my favorite type of clafoutis is not going to use them since I prefer to eat cherries crues (raw) et pas cuites (and not cooked). So instead of the traditional clafoutis version, I make my own, with quetsches. I just couldn’t think of a better way to use this fruit juiciness, light sweetness and acidity. In a clafoutis, you typically use eggs, milk (and cream if using), sugar and flour (or cornstarch). But what makes this clafoutis recipe different from other recipes I tried is the fact that the fruit is cooked separately prior to being baked with the egg/milk batter. And to me, this makes all the difference in the outcome of the dessert. So when I fall short of ideas for a quick, easy dessert, clafoutis is high on the list. It could become your easy dessert fix too once you try it. So when will you try? Note: After researching on this particular fruit, I found out that the equivalent to a quetsche in English was a damson. PS: I have been travelling for the last week and will be soon back, looking forward to visiting your blogs again! Wash your plums and slice them open. Remove the stones. Heat 2 Tbsp butter in a pan. Add the plums and 2 Tbsp sugar and cook for 5 mns. Set aside. Butter small molds (or a large one) and sprinkle them with sugar. In a bowl, mix together the cold milk with the cornstarch. In another bowl, beat the eggs with the egg yolk. Add the sugar and mix well. Add the cream and mix. Mix the milk/cornstarch preparation with the egg one. 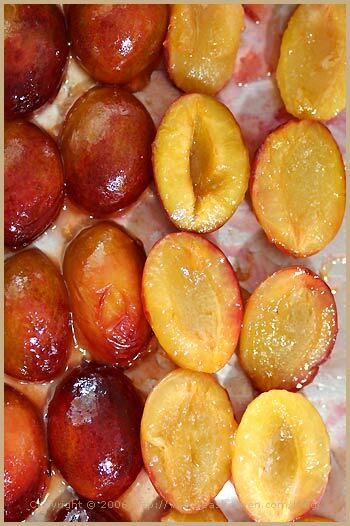 Place the cooked plums in your molds, face up. Pour the preparation over and cook in the oven for about 30 min, until golden. Remove from the oven. Sprinkle with sugar and eat lukewarm preferably. Lavez vos quetsches and coupez-les en deux. Retirez les noyaux. Faites fondre 2 cás de beurre dans une poêle. Ajoutez les quetsches avec 2 càs de sucre, et cuisez-les pendant 5 mns sur feu moyen à doux. Réservez-les de côté. Beurrez de petits moules (ou un grand) et saupoudrez-les de sucre. Dans un bol, mélangez le lait froid avec la maïzena. Dans un autre bol, mixez les oeufs et le jaune d’oeuf. Ajoutez le sucre et mélangez bien. Ajoutez la crème et mélangez à nouveau. Placez les fruits dans les moules, partie bombée vers le bas. Versez la crème et cuisez au four pendant environ 30 mns, jusqu’à ce que le clafoutis soit doré. Retirez du four et saupoudrez de sucre. Dégustez tiède, de préférence. Oh, Béa, I have been missing you. Do hope you are having a beautiful time. I’ve always wanted to see the New England fall colors. Your clafoutis look glorious, yes I think I enjoy the cherries better by themselves. Oh, beautiful! I have to say that I am also looking forward to the fall and all the wonderful food it brings! These plums are divine! Le clafouti c’est le dessert prefere de mon grandpere et maintenant de mon mari! C’est tellement simple et tellement bon! Moi aussi les quetches ca me manque! Oh, that’s wonderful. Damson plums are quite nice. I’ve always wanted to make clafoutis and yours is the nicest looking one I’ve ever seen. Seriously! je te fais un petit coucou depuis Paris (cette fois ci!) et je te souhaite un bon week-end! I´ve already made strawberry clafoutis after your recipe earlier this summer, but with quetsches (or Zwetschgen, as they are called here in Germany) I´d rather make a cake, just the quetsches on a sweet short pastry, sprinkled after baking with sugar and cinnamon. The idea of having so many quetsches to not know anymore what to do with them is quite lovely. 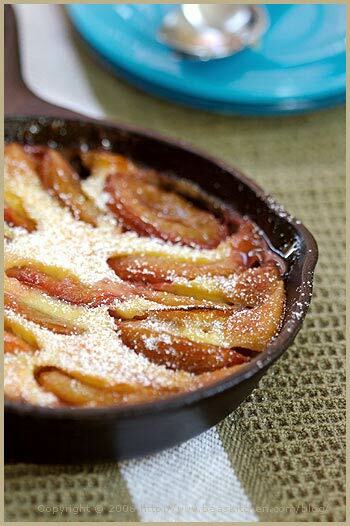 But you forgot one ingredient and direction for the plum clafoutis … I need you to come and make it for me! Oh Bea…those photographs are so beautiful they make me want to cry. What a marvellous way to enjoy these fruits! Je suis comme toi B.a, j’aime beaucoup cette saison des récoltes. Et le clafoutis est superbe. C’est marrant, j’en ai justement un dans le four!! miam, miam, I love all kinds of clafoutis. 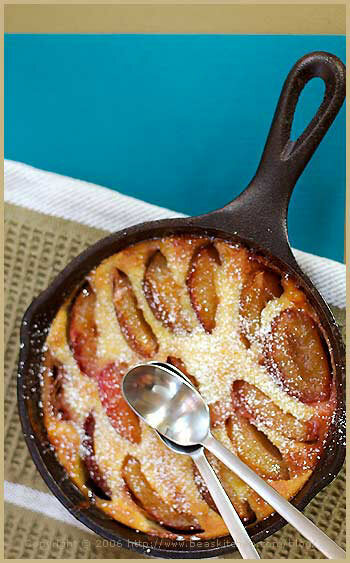 I like how you used this skillet to make it in, I use one to make tarte tartin in, but will try it for my next clafoutis. Gorgeous and mouthwatering, as usual. Here’s a question about cherry clafoutis, Bea — do the pits really add flavor? I’ve had both ways and can’t tell the difference, but I am NOT a cherry expert. Kind of fun and funky to find the pits and I am happy not to have to remove them myself in the cooking, but I just wondered…. Beautiful Bea. I love the way the clafoutis looks once it is cooked and puffed up! Joli! Mais je crois que je prefere encore l’eau de vie, ton evocation y fait beaucoup d’ailleurs. Sounds (and looks) delightful! Beautiful photos, as always! Coucou Lilo, mmm tu as bien de la chance d’avoir un quetschier. Profites-en bien ! Kitchenette, ah oui ca fait la différence, pas vrai ? Tanna, thanks a lot. I just got back last night! Will respond to your email soon, promise! Helen, ah oui, c’est tellement bon ! Sher, Yes my mother-in-law from Ireland told me they were called this way, so I searched and was delighted to find out they just looked exactly like quetsches. Peggy, coucou, profites-en bien ! Neele, yes your ideas sound good as well. I love quetsche tart too. There is an Alsatian tart particularly that I like, with pâte levée. Ellie, thanks so much. You are sweet. Tarzile, ah oui, j’imagine que les couleurs de l’automne au Québéc doivent aussi être magiques. Mitsuko, j’espère qu’il était bon. Riana, yes the skillet is pretty fun to use for that. Claude-Olivier, ahah, merci, ca me fait très plaisir. Snap! I have been on the lookout for damsons for the past week in London. Haven’t seen them yet, but it won’t be long now. Will definitely try the clafoutis when they appear. I’d never made a clafoutis in a cast iron skillet, with cornstarch instead of sugar and cooked fruit instead of fresh so I just had to give it a try. I used a few damson plums and three mission figs. I have to say that this was the silkiest, most delicate clafoutis I’ve ever tasted. Hi. Just wondering if someone can help. I have recently made (with the local distiller) 22 litres of 48% proof plum eau de vie. It is drinkable, well sipable and I have been told it will improve with age. What I would like to do with some of it is make some different flavours ie as you would with Sloe Gin etc. Are there any good recipes or ingredients I could mix with the spirit. I hope to have another good harvest of plums this year and intend pickling them. Many thanks. My wife discovered clafouti while living in France. We now make both plum and cherry clafouti with local fruit when it is in season. Baking it in the cast iron we inherited from her grandmother only adds to this old-world delight. When I make it for friends they have no idea just how easy it is to make – thanks for sharing! This is quite an old entry but I feel I must comment. Merci pour cette recette! J’ai fait ce clafoutis aussi dans une poele en fonte et c’etait delicieux.Moi aussi je suis de l’Est de la France… Verdun!. Testée et approuvée ! Je n’ai pas fait revenir les quetsches mais j’ai saupoudré le tout de sucre aux 3/4 de la cuisson puis passé sous le grill à la fin. Je ne te dis que ça. La maizena est une excellente idée, je trouve ça beaucoup plus fin qu’avec de la farine. Une seule suggestion : diminuer les quantités de sucre de moitié car c’est assez riche comme ça (et encore, j’ai utilisé du half-and-half, je ne suis pas aussi gorumande que toi, je pense !). Mille mercis pour la recette. For some reason it didn’t work for me. Perhaps the reason is that i used pretty deep baking dish.In the end, I had three layers – dense one, the one the looked like an omelet, and plums. I know that you are really busy right now, but I would appreciate if you can advise me on what I could do wrong. I wish I could have your recipe in alternative measurements like grams and milliliters. I am afraid if I’d convert them myself I will affect the perfect balance and the result won’t look and taste like yours. Super! J’ai trompee les prunes dans le cognac pendant 3 jours, puis j’ai fait une sauce vanille avec le cognac… delicieux. Merci!